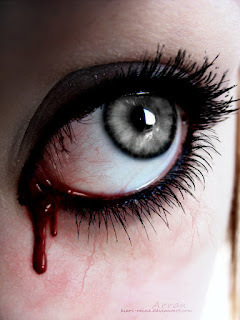 Calvino Inman regularly sheds tears of blood, up to three times a day and up to an hour each time. The first time it happened his mother, Tammy Mynatt, rushed him to the Emergency Room but by the time they arrived, the bleeding had stopped. Inman was so frightened that he asked his mother if he was going to die. Kids that go to school with Inman are afraid, thinking he may be possessed. While cases are uncommon, they are not unheard of. Some cultures treat this type of thing with fear, while others associate it with stigmata, meant to represent the blood of Jesus on the cross. Other examples of eye-ducts crossing wires are people who drink milk and squirt it out of their eyes, and smokers who blow smoke out of their ears. 13-year-old Twinkle Dwivedi of India has a disorder where she loses blood through her skin without any cuts or scratches. She must undergo transfusions after pints of blood seep through her eyes, nose, hairline, neck and soles of her feet. Medics believe this is an extreme version of a rare blood platelet disorder that has no cure. Her blood is dangerously low in clotting particles, making her blood watery. Dr. Barrett G. Haik, Director of University of Tennessee’s Hamilton Eye Institute, says haemolacria is common in people who have experienced extreme trauma or have recently had a serious head injury. Haik and a team of researchers published a 2004 study in the Journal of the American Society of Ophthalmic Plastic & Reconstructive Surgery between February 1992 and January 2003. Only four cases were recorded and in all cases the bleeding stopped on its own. Dr. James C. Flemming, ophthalmologist at the Hamilton Eye Institute, is reviewing Inman’s medical records, looking for complications such as blood clots, growth or tumor near the eye, or even a simple infection. An analysis will also include a psychological evaluation to rule out the possibility the tears were faked. There have been cases where children seeking attention found creative ways to simulate haemolacriatic symptoms. Tammy Mynatt just wants someone to help her son.